During the celebrated Salon International du Dessin in Paris, Sotheby’s is holding its first sale dedicated to works on paper on Thursday 23 March at the Galerie Charpentier. Collectors will be delighted by this first edition, with 145 works ranging from a romantic ink drawing by Victor Hugo to the politically committed drawing of Adel Adbessemed. Treasures featured in the sale include one of the very last drawings by Henri Matisse, brushed in India ink, from the collection of Claude Duthuit, the painter’s grandson: a marvel of simplicity and beauty. Also included are very important works by Berthe Morisot, Pablo Picasso and Joan Mirό. 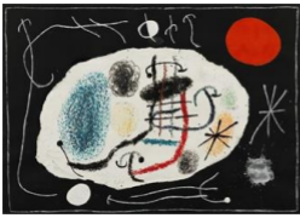 Also on offer is a private Parisian collection assembled during the 1960s, containing drawings by Matta and some fine ink works by Henri Michaux. 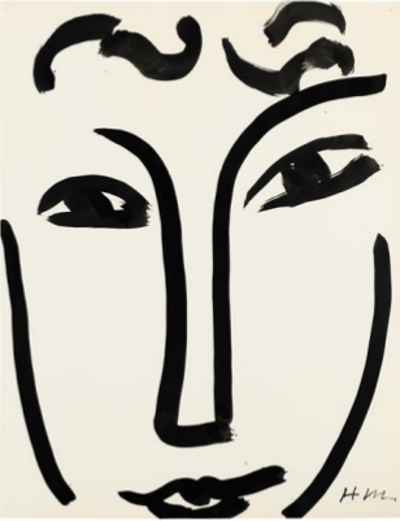 Visage (the cover picture of this press release, estimate: €800,000-1,200,000), 1952, is a masterpiece, brush and India ink drawing, dating from Matisse’s final years. It comes from the personal collection of Claude Duthuit, the painter’s grandson. In the twilight of his life, too exhausted to paint, Matisse returned to drawing and reduced his art to the very essence of the line. In 1948, he tackled the decoration of Chapelle du Rosaire in Vence using this technique. After the chapel was inaugurated in 1951 (Matisse considered it his absolute masterpiece), the artist devoted most of his efforts to his large cut-out gouaches and ink and brush drawings. As the art historian Pierre Schneider rightly pointed out “These large dazzling black and white sheets of paper are Matisse’s last paintings’ (Pierre Schneider, Matisse, New York, 1984, pp. 652-654). Visage is a beautifully refined example of these series of portraits. The very epitome of purity and elegance, its line is economical but highly expressive. As Barbara Duthuit states in the certificate of authenticity, it “… belongs to the group of Henri Matisse’s very last drawings.” The powerful line of this work and the fact that the artist decided to “zoom in” on the face instead of representing its contours, more traditionally, make it resolutely modern. Only a few “faces” of this quality are known in the international market; most are already in the collections of famous museums, like the New York Metropolitan Museum of Art and the Pierre and Tana Matisse Foundation. These particularly touching ink and brush drawings are rightly considered the master’s aesthetic testament. We also point out a collection of 19th -century work. 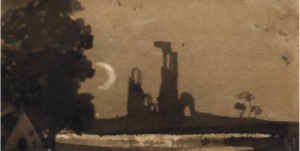 Among some beautiful works by Odilon Redon one also finds a romantic ruin by Victor Hugo, Burg en ruines (estimate: €10,000-15,000), in brown ink wash on paper, dedicated to the sculptor Robert David d’Angers: evidence of the close friendship between the two men that resulted in a copious correspondence in which this drawing was included. 3 This selection also contains a group of works by the Symbolist artist Gustave-Adolphe Mossa (1883-1971), including Poppée (estimate: €10,000-15,000). It reflects the master’s many influences, ranging from the Quattrocento to Art Nouveau. The subject is Poppaea: the scandalous courtesan who conquered the heart of Emperor Nero. The technique of pastel is superbly represented by three works by Edgar Degas: Entrée de village, c. 1895 (estimate: €150,000-200,000), Au Café-concert, deux chanteuses, c. 1878 (estimate: €200,000- 300,000) and Chez la modiste, c. 1885 (estimate: €300,000-500,000). 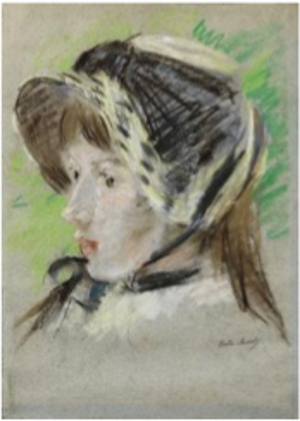 Degas focuses on the ‘modern Parisian life’ of the time by immortalising a milliner at work, using his signature daring compositional approach reminiscent of his stolen moments behind the scenes at the Paris Opera. Here the medium of pastel marvellously expresses the transient nature of the hat-maker’s work. It is a great privilege for Sotheby’s to be auctioning a pastel by Berthe Morisot restituted to the beneficiaries of David and Flora David-Weill by the Salzburg Landesregierung on April 27th 2016, over 70 years after it was looted by the Nazi authorities. Until now, Jeanne Pontillon à la capeline, 1884 (estimate: €60,000-80,000) had been held in the Museum der Moderne in Salzburg. Doubts on the work’s provenance and the circumstances of its arrival in the museum’s collections were expressed in 2009. In-depth research led to its restitution. This delicate pastel, executed in delightfully fresh colours, is a moving illustration of the art of Berthe Morisot, one of the very few women to gain admittance into the coterie of Impressionist painters, and who took part in nearly all the group’s exhibitions from 1874 onwards. Here she depicts her niece, Jeanne Pontillon, who was the model for several of her works. Several remarkable drawings by Pablo Picasso will be featured in the sale, including four in ink and pencil on paper and dated from between 1960 and 1970: Deux nus, 1970 (estimate: €150,000- 200,000), Nu assis et singe au chapeau, 1972 (estimate: €220,000- 280,000), Le peintre et son modèle, 1970 (estimate: €300,000- 400,000), and Nu assis et deux personnages, 1968 (estimate: €300,000-400,000). These works bring to light the painter’s incredible creativity during the last years of his life. 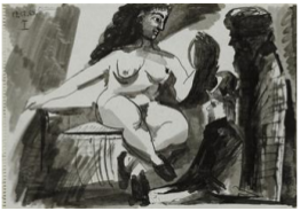 A fifth drawing, Femme nue debout les bras sur la tête (recto), études de nus (verso), 1946 (estimate: €300,000-400,000), comes from the collection of Marina Picasso. In this piece, the artist glorifies Françoise Gilot by outlining the famous figure of the Woman-flower. 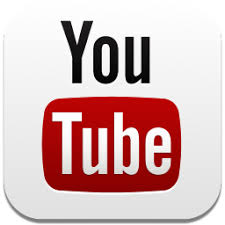 There are also several major gouaches by Joan Mirό. These include two sketches for the famous work Le Lézard aux plumes d’or combining glue, cut-outs, gouache and pastel. Both dated 1965, they once belonged to Louis Broder, who was Mirό’s editor, and was behind this legendary work (estimates: €120,000-180,000 for the sketch for plate 13, and €180,000-250,000 for the sketch for plate 6). Femme, oiseau, étoile, 1943 (estimate: €200,000-300,000) is also imbued with Mirό’s grace and poetry. Works on paper by contemporary artists will also be in the spotlight, including a seminal piece by Adel Abdessemed, Lampedusa (estimate: €50,000-70,000): a work from the series of black chalk drawings on the theme of migrant boats that resulted from the major installation piece Hope that was featured at the artist’s Centre Pompidou exhibition in 2012. 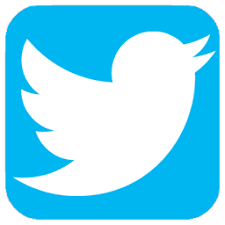 The island of Lampedusa is the notorious landing point for thousands of refugees crossing the waters from the coast of North Africa. 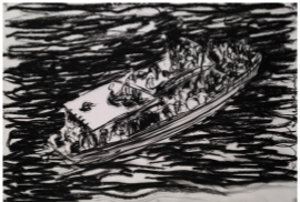 Abdessemed bases his drawing on contemporary media images and news reports but sublimates them through the medium of black chalk into an archetypal theme. He consciously revives the powerful heritage of Théodore Géricault, and his Raft of the Medusa. The sale also includes works from a private Parisian collection assembled during the 1960s.